So recently I noticed a changing mole on my forehead. Fearing the worst I went to get it checked at the GPs. Keep reading to find out more! Malignant melanoma (MM) can be an aggressive type of skin cancer and in the UK over the last 10 years or so, there has been a 59% increase in the number of men with MM and a 36% increase in women (Source: Cancer Research UK). That represents about 14,500 new cases, which is about 4% of the total number of cancer diagnosed in the UK. It is not the actual number (new cases) that are the issue here, they are not huge. It is the percentage increase that is huge. When you get percentage increases as large as this, the graph hits a take-off point where it gets steeper and steeper. We are just about at that take off point here in the UK, if we do not ‘nip it in the bud’ now, we will begin to see large numbers. Malignant Melanoma incidence, in the UK, has increased by 360% since the 1970s (see graph below). Question: What happened in the UK in the 1970s? For the first time we, as a nation, were able to afford to go abroad on holiday to hot, sunny places! I remember the 70s quite well, but there is one thing that I do not remember. I have no recollection of my parents ever putting suncream on me as a child. It was not as readily available as it is now. So when you combine hot sunny holidays with no sun protection, you start to get an increase in numbers of skin cancers. You can see by the graph that since the 70s the incidence rates have got steadily up year on year. Risk of MM is related to UV radiation exposure which we get mainly in sunlight, however sunbeds are also becoming an ever increasing problem. It seems that we in the UK will go to extremes to get our ‘sun’ fix. Tanning salons seem to be sprouting up all over the place. Think about what happens when we (I am using the royal ‘we’ here as I do not frequent sunbeds!) visit a sunbed. We take all out clothes off. Now, parts of our body that ordinarily we would cover up on the beach, are now exposed to high levels of UV radiation. And I do not know anyone who goes on a sunbed, who puts on sun block! So not only are people exposing parts of their body, which are not used to it, to these high levels of UV radiation, but they are doing it unprotected! And we wonder why we are getting the levels of MM that we are! The point is, there is a risk involved in exposing the body to high levels of UV radiation. Yes, I know we need UV exposure to generate Vitamin D, but only about 20mins a day on normally exposed area is sufficient. Overall, high exposure of UV is not that good for us and will generally increase the risk of MM. I nearly forgot, how did I get on at the Doctors? Well, it was not MM! It was a Seborrhoeic Keratosis. Apparently you start to get them as you get older! But the point is, I was worried, so I got it checked out! Was I wasting the Doctors time…definitely not! If you are worried about a mole or any other skin lesion, please get it checked out. Especially in the case of malignant melanoma early diagnosis really does save lives, with the vast majority of people diagnosed at early stage surviving. If you would like to know more about skin cancer, and cancer in general then book yourself on one of my webinars or courses. More details can be found at my website. Or contact me here on LinkedIn or email doh@ohconsultancy.co.uk. David is a Specialist in Cancer Education & Training. 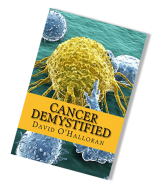 With over 25years of experience as a cancer educator you can rest assured that you will further your cancer knowledge with his expert advice and guidance.